And there was a Lalgudi. I am full of trepidation as I write this. I am writing about an extraordinary musical soul who lives amongst us and has created a wonderful legacy of music. He comes from a family of musicians, and his great grand-father was a disciple of Saint Thyagaraja. In fact Thyagaraja composed five magnificent songs while he was visiting this disciple in the village of Lalgudi. That was over 170 years ago perhaps. And today, there is a musician amongst us who is totally unmatched for his contribution to Carnatic music. Who am I to say this? Actually a nobody. But I cannot help express these thoughts as I listen to his music streaming from a glorious blog site. This is a 1970’s concert with Palghat Raghu on the mridangam. Listen to it and you will take a few hours to recover from its musical impact. It is studded with gems. Thanks to the great rasika and patron of the arts K. Srikantiah of Mysore Parvathi. The blog created by Vishwanath of New Jersey is a cornucopia of memories and music. I attended three concerts of Lalgudi in Mysore in 1967-68 within a span of 3-4 days. I was so mesmerised, I sat close to the dias. And I got his autograph. He signed with a flourish, the letter L shaped like a violin. This great maestro has composed so many wonderful tillanas and other songs. He has given countless magnificient concerts. He has accompanied the great musicians like only he can. He has trained students who can hold their own today. He has created an incomparable solo violin style. 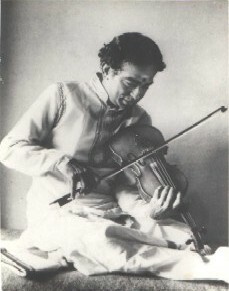 The way he modulates the sound, the way he makes the violin speak the words… the way he creates a wonderful dialogue in the improvisation passages, bringing to our hearts the very God of music…. The way he coaxes the violin time and again to do even more…It is difficult to see where the bow and strings end, where the player begins and ends, and where God steps in and takes over….. Listen to the concert in the link. Each piece is a nugget. Kharaharapriya, Jayathasri, Mohana, Yadukula Kambodhi, Shanmukhapriya, the ragamalika in the end where he plays five octaves on the violin……Krishna nee begane….it is an endless treat. Sometimes one is glad to be alive in THIS world. Where there is music and there is Lalgudi…..